A total natural in the sky, this super-sniper has the very unfortunate habit of gloating when it lands a shot. 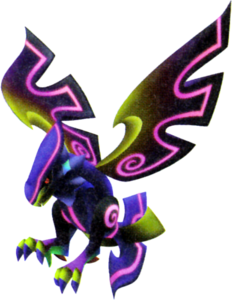 The Eaglider is a Dream Eater that appears in Kingdom Hearts 3D: Dream Drop Distance. Its appears to have circuitry on many parts of the body. Its circuitry design matches that of its most appeared world The Grid, though it also appears in The World That Never Was. Taka (鷹) is the Japanese word for hawk. Its English name is a portmanteau of "eagle" and "glider". 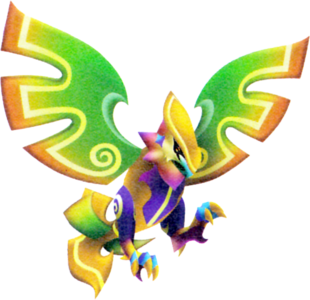 The Spirit Eaglider has a purple and yellow-orange body with a yellow-orange head and green wings that fade into yellow and eventually orange on the wings' outer edges. If one looks closely enough at the wings, the green part looks as if it is also fading into teal or a shade of blue. The Eaglider also has cyan talons and a cyan beak, and it also has a yellow-orange, green and yellow tail that resembles the back end of a plane. ↑ 1.0 1.1 Becomes available when in Ace disposition. ↑ 2.0 2.1 Becomes available when in Vulcan disposition. Sora can obtain the default Eaglider Recipe from a chest in The Grid. The Eaglider can be created through six different recipes. The first recipe is a rank E recipe. The second recipe is a rank D recipe. The third recipe is a rank C recipe. The fourth recipe is a rank C recipe that has a 30% chance of transforming from Cyber Yog. The fifth recipe is a rank B recipe. The sixth recipe is a rank B recipe that has an 80% chance of success. This page was last edited on 3 April 2019, at 17:16.